While almost everyone asks before Rooting the device on why someone should root the device, then we would like to re-iterate that once you have rooted you can then install the apps which requires the root access along with the freedom to install the custom ROM firmwares of your choice. So, in this article we will be checking out on how you can Remotely Turn off your Android phone. So, just in case if your friend takes off your phone from you and if you wish to turn it off remotely, you can now very well. No, we are not talking here to buy some sensors or like that but yes all it takes is an APP installation. Pre Requisite: Make sure that your phone is rooted before you proceed to the next step. To check on whether your phone is rooted or not, you will have to download the “Root Checker” app from the Google PLAY Store. Just in case if your phone is not rooted and wish to root then do let us know which is your phone model along with the current firmware version in the comments section to help us guide you to root the device. Download the “Remote Turn off” App from here to your computer. Once downloaded, connect your phone to the computer with the help of original USB cable and place the Zip file of “Remote Turn off” in the device. Disconnect the device from computer and turn off your phone so that it can be entered in the Recovery Mode. Alternatively, you can also enter your device in the recovery mode with the help of ROM Manager app. Now in the recovery mode screen, select the option of “install zip from sd card” to select the zip package “Remote Turn off” app in your device and then once the package is flashed, you will need to select “go back” and then select the option of “reboot system now” for rebooting the device. 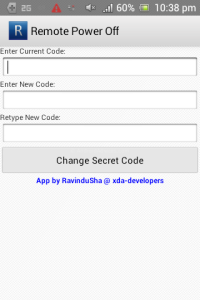 Now, you need to open the app Set the Code which you wish to set for turning the phone. You need to make sure that you do remember the code which you are setting. You can also refer to the Help Section in the app to know more about this app. So, there you go, you have now successfully learnt on how to turn off your phone remotely without much hassle. Do let us know if you come across with any issues as we will make sure that the same is addressed at the earliest. Someone remotely shut mine off completely. How do I get it to power on? How to send commands to phone? My model is karbonn s5 titanium.how to root it? I have a Verizon Samsung note II and I would like some help to safely root my phone to be able to use the remote sms turn off app. Where is the Help section in the application?????? Please , what is the password ??????????????????????????????????????????????????????????????????????????????????????????????????????????????????????????????????????????????????????????????????????????????????????????????????????????????????????????????????????????????????????????????????????????????????????????????????????????????????????????????????????????????????????????????????????? Hello. I need detailed instructions on how to root the following phone, please. 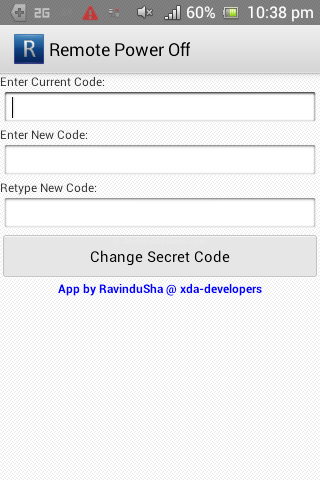 As above: Instaled but it’s necessary a password to configure the app. Who can help? Thanks in advance! How to root samsung galaxy s4…I9500??? I just updated my galaxy s4 to the latest version (I545VRUAME7) and was told that after this update I would no longer have root access and my bootloader is locked. I also heard that I could no longer root my device the regular way and a new way would need to be found. Consequently my phone is not rooted now. If you know how I can root it (preferably a one click tool as I’m not real good with this stuff) that would be great. Also I need the original password… Who can help? 4.0.3 XXLPQ . Android version . Need ROOT please guide me 🙂 Thank you ..
Hey i have installed this app n while launching it is asking for the current code. I dont know this. Please help me with the current code to launch this app. Don’t have the current code to set the new code please email. Hi, my phone is not rooted. Current Firmware is gingerbread 2.5 I think. How to root Sony Xperia U? Installed, but lack the keyword to set my password. Please email so I may use the app. Enter “null” (without the quotes I assume)as the keyword, it’s in the instructions from the dev .. click on Source:XDA link above for instructions. The app .. remote_power_off_v1.2.zip .. is located on that page.